A Spoonful of Sugar – Sugar vs the Reef ? On Friday Lucas and I spent the day at Simon Mattson’s farm, having a fun time printmaking with his wife Susie, son Luke and daughter Sophie while Simon was out in the paddocks working. The harvesting crew could be seen in the background, giving the fully grown sugarcane a number one clip to the ground. Earlier in the morning it was raining in Mackay and I was worried for their harvest – it becomes difficult to harvest when rain makes the ground boggy. Luckily, the storm bypassed Marian and Simon’s harvest continued. He said that by the end of the day about 50% of his crop would have been harvested. Now they’ll have to wait about six weeks for the harvesting crew to return, as the farmers have to not only share the harvesting crew around but also share milling time. In order for there to be fair access to the Marian Mill, farmers work to a quota system, which means that not all of their cane can be milled at once. This is further frustrated by the continuing machinery breakdowns at the mill. It really gums up the whole works when the mill operates at half capacity or no capacity at all. When Lucas and I went on a nighttime tour of the Marian Mill last week, one of the last things we saw at the end of our tour was the raw sugar product, which then goes to a refinery for further processing. It is a lovely caramel colour, with largish crystals and a rich smell from the molasses content. At that moment I wondered, why isn’t this product bagged here and sold directly from the mill, or at least a local outlet, and branded as “Mackay Sugar”? Back at the farm, Susie offered us a cup of tea. 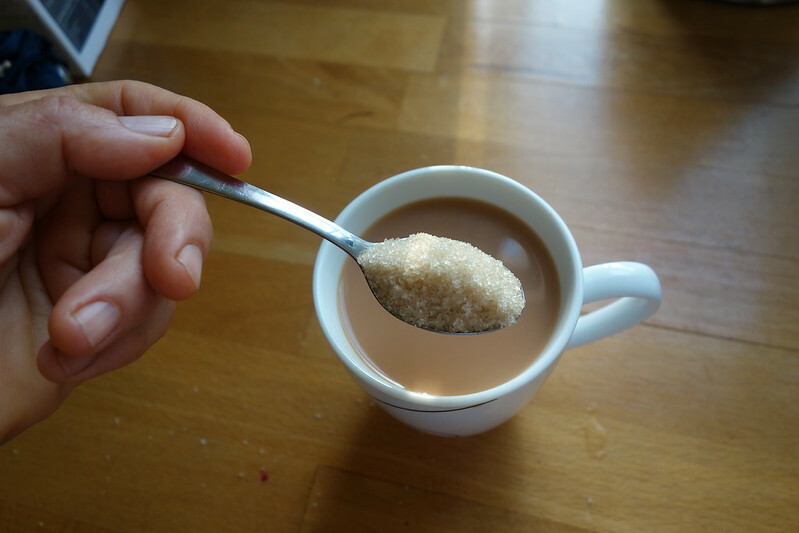 She put a spoonful of this raw sugar from the Marian Mill in my tea (each canefarming family can buy one 25kg bag of raw sugar from the mill per year for $25 – the Mattsons share this with two other families). It was delicious, a completely different taste from refined white sugar. Once again, I wondered, why aren’t they packaging and selling this from the mill, or even distributing it? I began to imagine a paper bag of “In the Raw” Mackay Sugar with funky graphic design. In the longer term, when regenerative agriculture practices become the norm, Marian Mill would become Australia’s only organic sugar mill. Why not? Let’s face it, sugar has a bad reputation which drives some people off sugar altogether. But most of us eat it in some quantity. Sugar comes from a plant – it’s a perennial grass. Cut it down and it grows again for a limited number of years. Sugarcane juice is the most immediate transition from the plant to a consumable product. Is there a market for sugarcane juice too? There are a few local hand operated sugarcane presses around here, but they’re not common. Sugarcane juice and this raw, molasses-rich sugar that I tasted made me think that the less we refine sugar products and the less chemical intervention in the growing of sugar, the more we could recognise sugar for its better qualities. My fantasy of a local sugar market was brought back to earth when I asked Simon why sugar produced in Mackay isn’t under local control. His explanation went back into the history of sugar and its control by the wealthy few. It seems that it is still a similar situation today, with global sugar being controlled by powerful corporations. Coffee and sugar are a global commodity treated in much the same way as gold. I can’t quite come to terms with the transition of power from the farmer growing a plant in soil to a spoonful of sugar stirred into a cup of tea. « A Demonstration Farm? » What might a Demonstration Farm look like? Yes I had the same bewilderment when I went to the Walkerston Leagues Club in Mackay for a talk by soil scientist Graham Stirling. 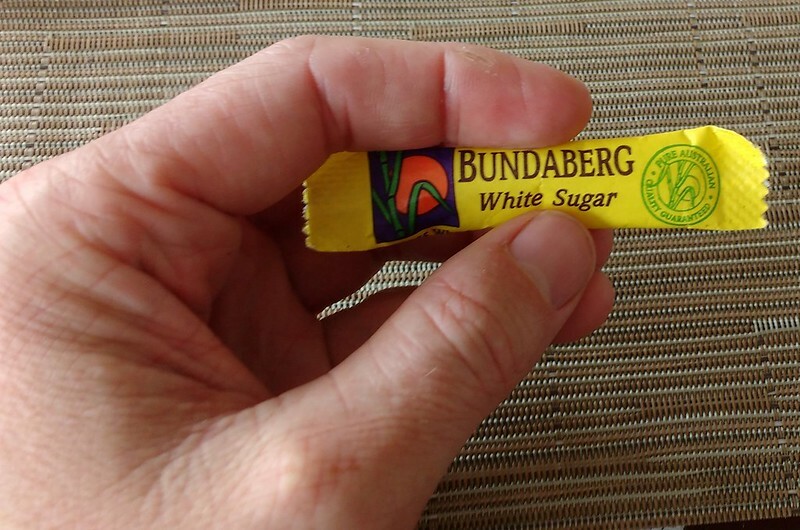 Our tea and coffee was served with Bundaberg Sugar! It would be good to see if we can meet up with someone from Mackay Sugar to try and understand the obstacles to packaging and selling this product which is uber-local. From Simon’s farm in Marian to the Marian mill is only a couple of kilometres, and as you say, that lovely flavoursome stuff you’re putting in your tea would then be marketable as having a clear “food provenance”, local pride etc etc. So interesting Kim. Joe Muscatt had encountered a small scale, thriving, rapadura sugar mill in one of his overseas research trips. When he got home he investigated whether it was viable on his own farm, and in the end decided against it: there was too much risk of competitive forces in the region pushing him out of the market. Thanks Laura. Yes, localisation of food production, processing and distribution is a way of diversifying farming businesses. In theory, diversification makes agribusinesses less vulnerable to catastrophe than when all their eggs are in one basket. However, the sugar cane industry in Australia seems to resist to these kinds of adaptations, as we discovered when we met Joe Muscat. His idea to set up small scale milling in his own shed to make rapadura sugar would be awesome – it would mean a new product in the Aussie shops, and it could be branded local to Mackay. Mackay Council does seem to be interested in hearing about these initiatives towards on-farm processing. At the Greater Whitsunday Food Network meeting that we attended, there was a cane farmer who was trying to grow and process cassava on his farm. He was frustrated because of the additional costs and paperwork for licences and “change of use” that he had to comply with for local council regulations. These additional costs and admin tasks would be a disincentive for many farmers to diversify I think. Hi Laura, can you clarify what you mean by “there was too much risk of competitive forces in the region pushing him out of the market”? Do you mean that the sugar mills in the area might decide to get into the production of rapadura sugar if they saw that Joe was making a success of it and squeeze him out? I think so Kim, that’s how I interpreted it. Hey Kim and Lucas, rereading my notes from that convo with Joe – the rapadura mill was in Mexico. Just 5 guys and the process was all done by hand! Hi again Laura, I imagine that the sugar mills have some flexibility in what they produce. I recall one of the mill workers at the Marian mill saying that they are able to produce quantities of what they call “Jap sugar” (the sugar used in the making of sake) when the demand arises.